As I said in previous reports, I started writing these reports for myself. This may seem selfish but it forces me to be honest to myself and analyze the race not only with my emotions but also with a certain degree of logic. At the end of the day these reports are a tool for me to better understand my strengths and weaknesses. If they also help somebody else, great. Thus, I don't put myself any limits in terms of length and the level of detail. There’s a short note that I posted immediately after the race on my social media accounts, if you prefer to read that. 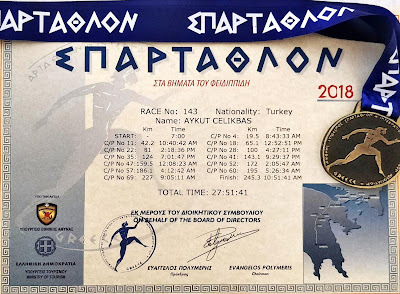 I’ve written three detailed English reports in the past, which you can access via the Spartathlon tab on the top right. I'll therefore try not to repeat some of the basic info about the race. But in short, the Spartathlon is a 246-kilometer (153 mile) ultramarathon from Athens to Sparta, held annually in Greece since 1983. Based on Herodotus's account, it represents the historical run of Pheidippides, who ran from Athens to Sparta before the Battle of Marathon in a day and a half to seek support against the Persians. 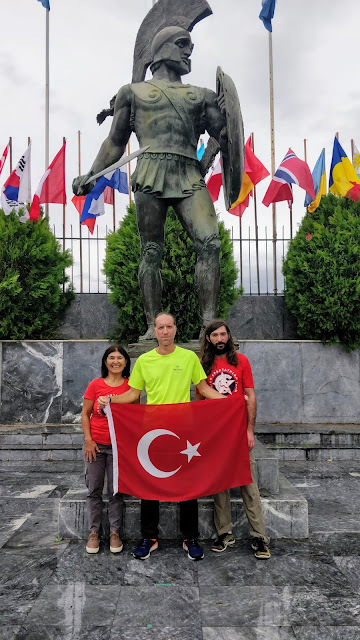 In 2014, I became the first Turkish runner to run the Spartathlon. I finished also in 2015 and 2016 but was unlucky at the 2017 ballot. 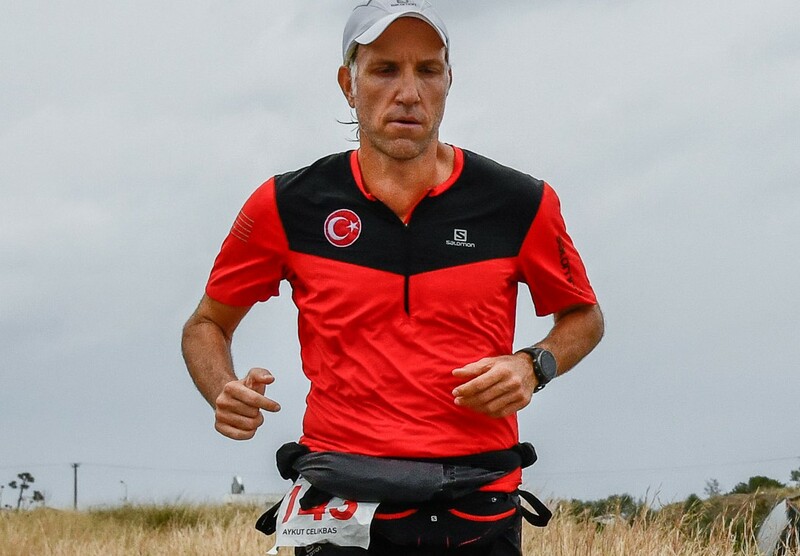 A friend of ours, Mert Derman, represented Turkey last year and also successfully finished the race. Who knows maybe it was for the better. In March that year, I had managed to break my arm during a night trail run. 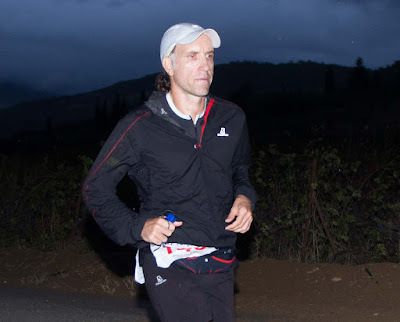 After that I focused on finishing my book “Ultra”, which became the first ultramarathon running guide book in Turkish. After that I ran a few races to get into form, including the Sri Chimnoy 50-mile in Canada and the UTMB-CCC in France. More importantly, I was in Chamonix to help and witness my brother Aytuğ finish the UTMB. 6 weeks later, I ran a good race at the Salomon Cappadocia Ultra Trail in October 2017. I was feeling stronger and stronger as the year progressed. Now I had the biggest challenge of the year in front of me: the Barcelona 24-hour track race. It was going to be my first 24-hour challenge. I set myself three goals: 200K (a good round number for a first 24hr), 212.5K (the Turkish national record) and 216K (Spartathlon auto-qualification criteria). I wrote a detailed report (in Turkish), so I won't go into much detail now, but I finished with 225.897 km (140.365 miles). This was beyond my expectations and topped my highest goal for the race. I wasn't aware at the time that this race would later play a crucial role for me at this year's Spartathlon. Let's just put it aside for a moment, but I’ll be coming back to it further down this report. 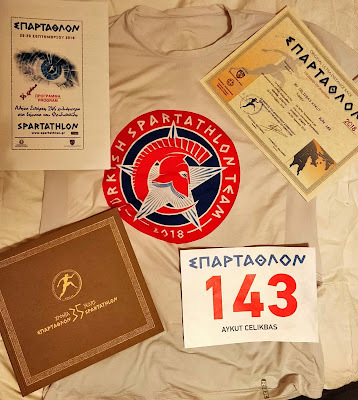 One thing I hear a lot is that since I finished the Spartathlon three times already it surely wouldn't be that hard any more. I'm sorry, but that’s totally the wrong conclusion. Yes, previous runs certainly give you some experience. But depending on how you use it, that can easily turn into a negative effect. Your brain knows all the pain and suffering that is needed to finish the race, and it will try every trick in the book to not make you go there again. If you're not prepared for this, I can guarantee that it'll be much easier to quit when things start to go wrong. If you want your previous experiences to have a positive effect, you need to be prepared and motivated as if you were doing it for the first time. The arguments that you used against your brain the first time will probably not work on your second, third or fourth one. Every time you step on the starting line you need to have a very strong motivation. Then―and only then― will your previous experiences help you in a positive way. In short, the Spartathlon doesn't care about your previous finishes. Every year you start from scratch. You'll kiss the foot only if you're really ready for the challenge. My main goal for the 2018 Spartathlon was, as always, to finish. This will never change. However, I knew that the races I ran in the last two years helped me progress as a runner both physically and mentally. When it comes to 100+ mile races, I knew I was at a better level than in 2016. 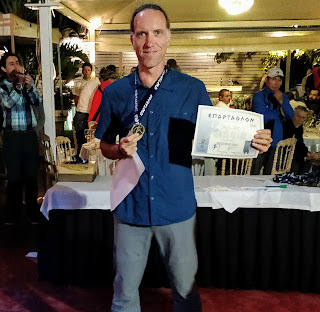 I needed to do a lot of things right, but with the right conditions I was confident that I could run a sub 30-hour Spartathlon. 30 hours is not just a round number when it comes to the Spartathlon. Even given the tough qualification criteria, only about one in ten runners manages to finish sub 30 each year. You can maybe compare it to a sub 3-hour marathon, but since the race time is 10x longer, I'd say the things that can go wrong also increase by a factor of ten. Preparation, strategy, planning, execution, problem solving, determination... I could go on and on. You need to get a lot of things right to make it happen. I arrived at my hotel on Wednesday around 7pm. All the runners are assigned to six hotels that are a few hundred meters apart in the Glyfada neighborhood of Athens. It's easy to think of it like an Olympic village. My roommate this year was Roman Tomasek from the Czech Republic. They had 15 runners in this year’s team and won second place both in the men's and women's race. Even more amazing to me is that all 15 of them finished and 7 ran under 30 hours. Some team! Roman himself is a very cool guy and a very fast runner. 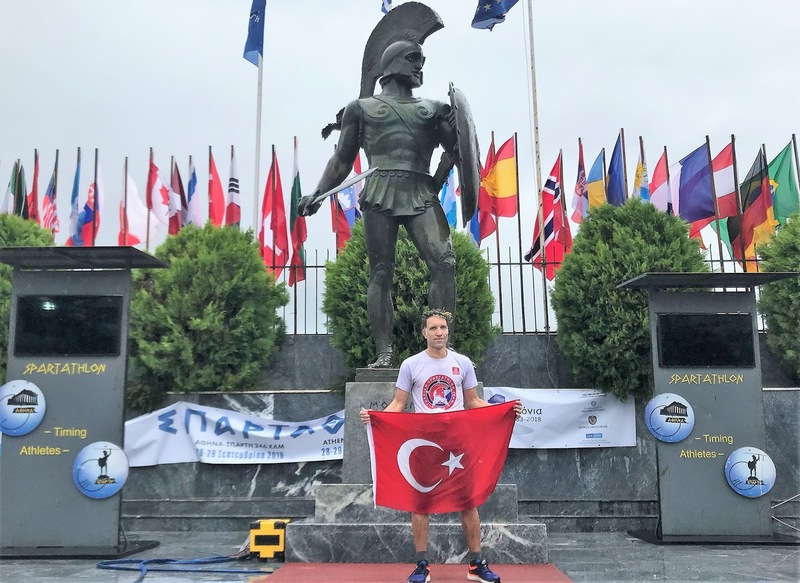 He ran the Spartathlon last year and finished in 27:27. His goal was to improve his time this year. 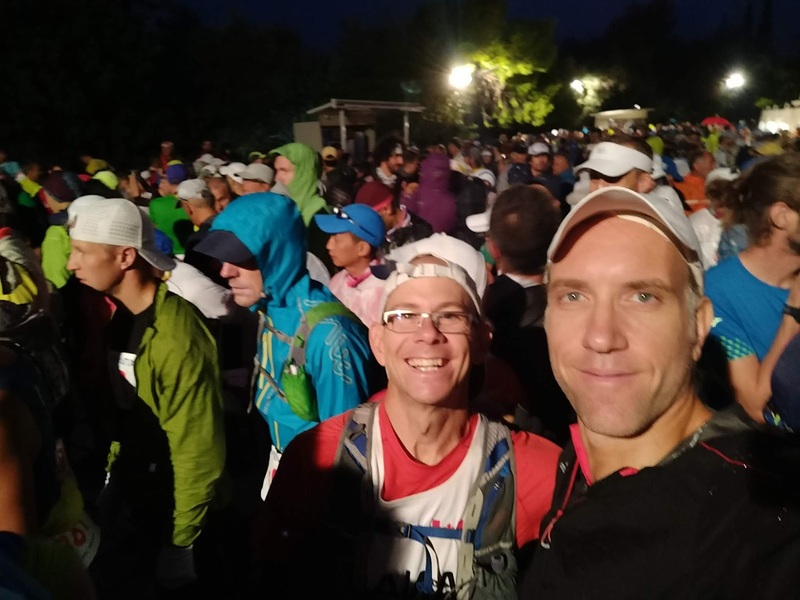 During dinner with a few Hungarian runners they said they heard that the organization is considering changing the route and that the mountain pass could be skipped this year, depending on the forecast. Zorba was seriously threatening the 36th Spartathlon, it’s called a “medicane", a Mediterranean hurricane. The decision about the possible route change was going to be announced during the briefing. To tell you the truth, I didn't like this news even one bit. Spartathlon has a route that stayed virtually the same for 35 years. You know that everybody ran the same route 25 years ago. Similarly, in 20 years people will know that you also ran the same one. 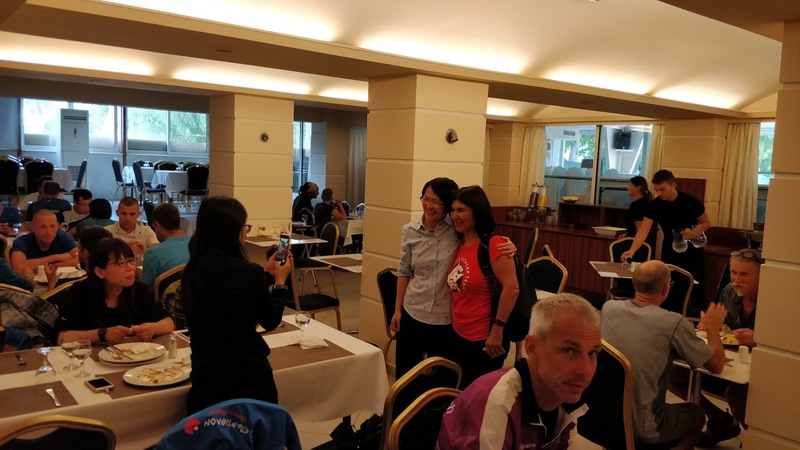 Security is important for sure, but there were people from more than 50 countries and I think all of us knew that it just would not be the Spartathlon without the mountain pass. I completed my registration on Monday morning and got my bib number. I'm number 143 this year. Of course, the first thing that comes to my mind is 1 + 3 = 4th finish. Just a bit of extra motivation to use during the tough times when I glance at my number, right? We also got the special album which was published to commemorate the Spartathlon’s 35th anniversary. I was contacted a year ago to write a short piece about my experience. 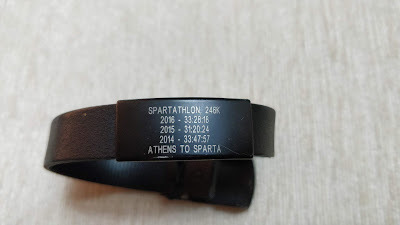 It was an honor to see my name among some of the familiar Spartathlon greats. My friends Suna Altan and Kerem Yaman were there to support me one more time. Suna has been in my crew during all of my four races and she's now easily one of the most experienced crew members out there. She knows the race inside out and knows a lot of people both from the organization and runners. She also likes to share her experience with rookie crews. Of course, it helps that she's also fluent in English and German and even knows more than a bit of Greek. Kerem was also with me in 2016. He's a very reliable friend that I can count on for everything. The only thing that concerns me about him is that he can be a little soft with me if I get whiny. That's why I told him to bring his whip with him! Of course, he’s also the designer of the Turkish Spartathlon logo and T-shirts. In short, with a great crew like that all I had to do was to concentrate on my run and not worry anything else. It was a luxury. Before the race, I provided my splits to Suna from the three previous races. She made a chart so that she could have an idea about when to expect me at certain checkpoints. I didn't want to carry a chart with me because I wanted to run by feel, but most of my previous splits are ingrained in my brain anyway. We went over our planning before the briefing. A solid plan A is always important, but in a race like this you need to have a plan B and a plan C. Even more importantly, you need to be flexible enough to adapt to extraordinary conditions (such as this year's Hurricane Zorba). While waiting for the briefing to start, it wasn't hard to sense the extra nervousness even in the Spartathletes with multiple finishes. Everyone had a plan for standard Spartathlon weather, but nobody knew what to expect in these extraordinary circumstances. Finally, the briefing started and Kostis, the RD, gave the answer to the most anticipated question. Heavy rain and winds were expected, but the regular route was in effect. With that sorted out I focused on what I could control. How to start the race in terms of clothing? Waterproof jacket or windproof? Long sleeve? Short sleeve + arm sleeves? I had a few alternatives and decided to wait and see the weather in the morning. My crew was staying at a flat near Acropolis, so after eating dinner at the hotel we went there to spend the night. Suna somehow manages to find a place closer and closer to the Acropolis each year. This year it was a mere 2-minute walk from the start line! I slept for about 5 hours and got up at 4:30am. The next hour consisted of my last mental preparations. Looking at the final weather forecast I ran a simulation in my brain and decided what to wear. I was going to start with the S-Lab Hybrid rain jacket, which is very light and it turns into a belt in 10 seconds if I needed to take it off. So that was that. After a fast and light breakfast we were heading for the start line underneath the Acropolis. Suna with friends from the Taiwanese team. Standing at the starting line, I'm thinking that this is where I'm meant to be. This race has become a very big part of my life and I'm 100% grateful for that. There's a light drizzle at the starting line and the wind is quite gusty. As I see many of my friends we wish each other success and hope to see each other in Sparta. It's always a mix of emotions at the starting line, but this year it seems like it's on a different level with the anticipation of Zorba. According to Herodotus, Pheidippides left Athens with the first light and reached Sparta the next day before dark. Hence the 36-hour limit for the 246 kilometer route. As the clocks show 7:00 we're off. And a few minutes later we're on the streets of Athens. A little later we stop at a railway crossing for about 30-40 seconds. The gate opens and we continue. This never happened in my previous runs. Light rain continues. After a two-week taper my body is full of energy and wants to go fast. 10K and the half marathon come and go quickly. This is where the school children were supposed to greet us, but this year they are not there, most probably because of the weather. Who can blame them? The rain stops after a while and I take off my rain jacket and turn into a belt. I'll be repeating this a few times until the 80K CP, depending on the strength of the rain and the wind. I know the night will be cold, so I’ll try to regulate my body heat as best as possible. Things are good approaching the marathon mark. Of course this might sound stupid, just like being happy only 6K into a marathon, but it still feels good to have a problem-free start. In the final few kilometers before the CP at Megara (42K), I realize that I've been getting faster by following a Japanese runner, so I force myself to slow down. 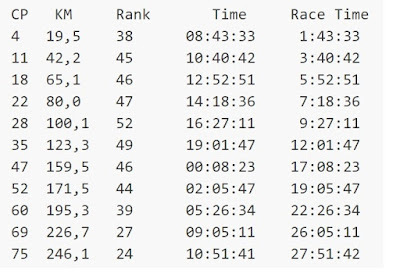 The first marathon is over at 3:40, 5-8 minutes faster than the previous three years. One down, five to go. I spend 45-50 seconds at the station. 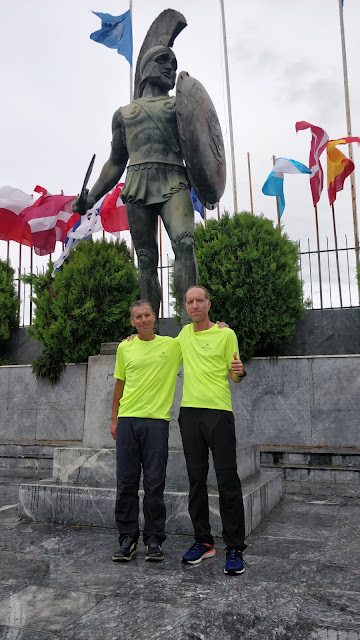 15x finisher Spartathlon legend Seppo Leinonen is there to support a Finnish runner and he tells me to pace myself until Corinth. I thank him, take some food for the next marathon distance and leave the city of Megara. During the long climb I take a few bites from a cheese sandwich. I try to replicate my nutrition strategy that worked quite well at the Barcelona 24-hour race. During the day I'll try to eat 200-250 calories per hour and fuel mostly with gels, sandwiches, coke and halva. I won't eat anything from the CP tables this year. I'm optimistic that this year I'll sort out most of my digestion problems which had a big effect on my previous runs. During the night I'm thinking to have mostly soup and switch to real food. Plans, plan, plans. Plans you think might work... Plans that have worked in the past. I'll see what the next hours will have in store for me. 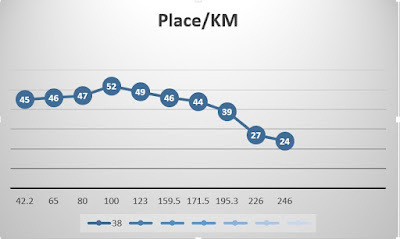 As I mentioned in my previous Spartathlon reports I always struggle mentally between 50 to 70K. This section has rolling hills where you start to feel the fatigue and there's almost another 200K to go. You start to realize the real length of the race (Hint: it's long! ), and the sheer weight of the distance falls on your shoulders. With the cooler weather conditions this year it's easier to deal with these thoughts and the kilometers seem to flow by smoothly. When you cross the bridge above the Corinth Canal you have about 2 km to Hellas Can aid station at 8OK. A few moments later someone calls my name on the left. It's Georgios Zachariadis, a 4x finisher of the race. He catches me and wants to do a selfie with me. Sure, why not? I call this first section the "warm up" and generally take 7:45 to 7:50 hours. This year, I cross the timing mat at 7:18. My first thought is that I "warmed up" too fast and will pay for this later on. In reality, this is the best I felt in my four Spartathlons at this point of the race. I almost never looked at the watch and forced myself to give walking breaks here and there. The bridge over Corinth Canal. Kilometer 78. Sparta Photography Club. Approching 80K. A quick photo with 4x finisher Georgios Zachariadis. My crew is ready with everything as planned. First order of business is putting on a new shirt. There’s lentil soup and rice on the menu. The soup goes down quickly but the rice not so much. Better not to force it. Somehow it takes 7.5 minutes, which is quite a bit longer than I anticipated, but in the great scheme of things it probably doesn't matter that much. A few minutes of shuffling and I'm able to find a good pace once again. In a standard year the weather in this section is quite hot and humid. This year there’s still a light drizzle and I'm grateful for it. Approaching the 100K mark I come across George Myers from the US Team. We chat a little bit and he tells me that this is his second try with the first one being a DNF. He says his legs are getting very stiff because he hasn't walked a step since the beginning. He tries walking for a bit then runs fast. Repeats this a few times like a fartlek section. We cross the 100K mat together at 9:27 which is 45 to 55 minutes faster than my previous years. I barely stop at the CP and continue alone (I would learn later on that George finished in 33 hours). Until the 114K mark it's slightly uphill going. It's not something you'd necessarily feel on a training run, but you definitely don't want to take a chance with 100K on the legs and 150K more to go. I slow down to power hike the steep last kilometer to reach the CP at Halkion Village. This is the place I get my headlamp each year. This time I'm faster by one hour, so it's still light out there. I decide to get my headlamp at the next crew station. As Suna and Kerem cheer me up I drink some lentil soup and put on my reflective bands. Still feeling good, so I don't want to waste much time and start running quickly. A few moments later someone catches me on an uphill section. We run together for a bit. I learn that Teija is from Finland and her coach is Seppo Leinonen. It feels good to talk for a little bit. She's very strong on the uphills and I hold on to her. Then the downhill starts and either she holds back or I get faster, so we split. Our paths will cross once again before reaching Sparta. I run alone for some time and see Sebastien in front. 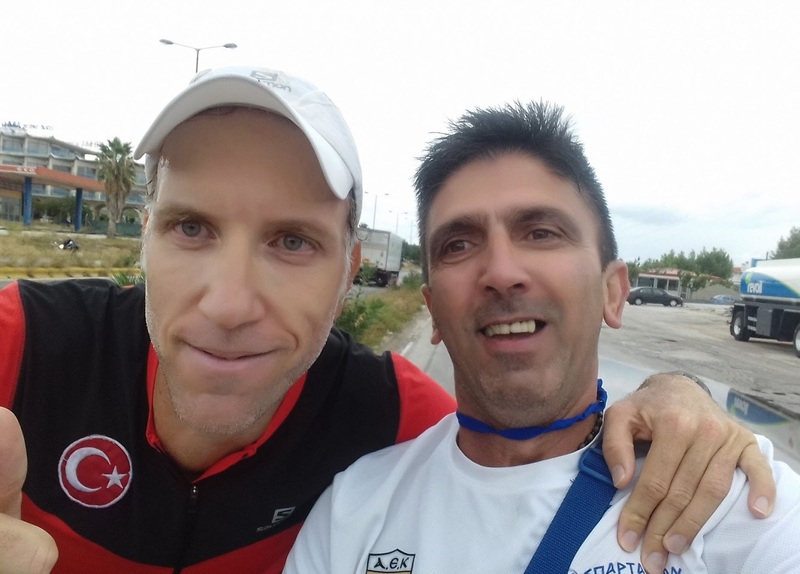 He's the only participant from Canada this year and it's his first Spartathlon. 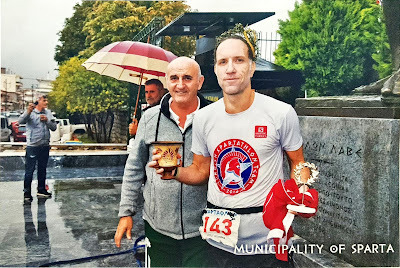 I met him in Ottawa this July when we were both running the Sri Chinmoy races. 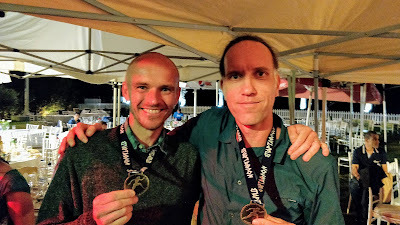 I ran the 100-mile race while Sebastien won the 24-hour race with 221 km, running steadily lap after lap with great precision. He tells me he ran a marathon for charity one week earlier and feels the fatigue in the legs. I tell him that he has lots of time and speed up. (I’d find out later that he finished successfully in 33:46). This is the first time that I'm running this section in daylight. My brain tries to warn me that I'm going too fast but this also gives me some extra motivation. Approaching the CP in Ancient Nemea at the 123.3K mark, the rain first accelerates then slows down and finally stops. 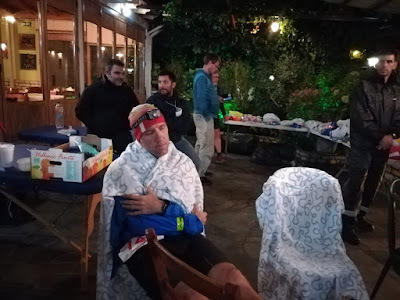 This is the mid point of the race in terms of distance, but the real challenges are in the second half: the mountain, climbing, sleep deprivation, extreme fatigue, and this year probably also Zorba. 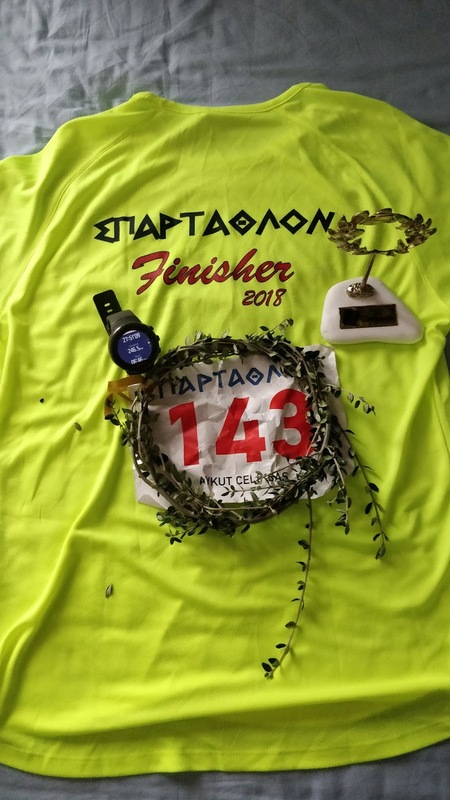 I think that depending on how you pace yourself the actual mid point of the Spartathlon in terms of finishing time is somewhere between 145K and160K. Now I only have a few kilometers to go before I reach the CP. I look up and see that the sky is covered with dark clouds. Something will definitely happen but the real question is when. I reach Ancient Nemea in exactly 12 hours, 80 minutes faster than my best time for this section. The only representative of Canada this year was Sebastien. Approximately 120K. Sparta Photography Club. A quick status check: compared to previous years my legs are in their best shape. Even though it's not ideal to mostly run in the rain for 12 hours straight, I'd still prefer this to the usually hot and humid Spartathlon weather even with a gun to my head. But my main problem this year is still the same: My calorie intake in the last few hours has gradually decreased and I don't feel like eating or drinking anything. My crew have a soup ready. I take a few gulps and it feels good. I had decided to try mashed potatoes this year, so I take a few spoons which is all my stomach can handle at this point. It'll be dark for most of the next 12 hours and I take my headlamp. Just before leaving Suna asks me if I want to change into a base layer. I ask Kerem to check the hourly weather forecast, and according to Accuweather there’ll only be 1 mm of rain (drizzle) for the next few hours. Nope, it doesn't seem worth the time and effort and I quickly take off. 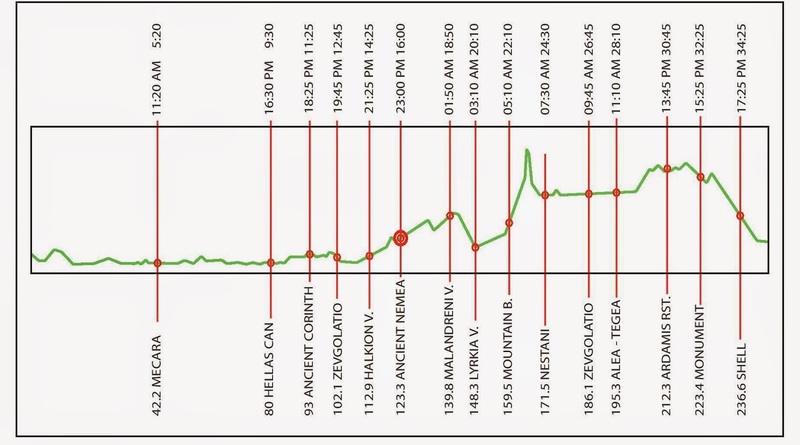 The next stage is 16 kilometers until CP40 at Malandreni. This section of the course usually takes me almost 2.5 hours and this is where my struggles usually begin. 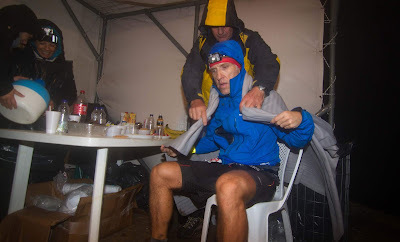 Just a few minutes after leaving the aid station, a heavy rain starts to fall with strong winds and lightning in the background. No more drizzle, it's now a downpour! In just two minutes I'm soaked to the bone. The problem is that there's a steep climb after the station and I had planned to walk most of it. Not possible any more because I start to shiver as soon as I walk. I force myself to run the whole climb while thinking about the 1 mm Accuweather forecast. It should surely stop soon, right? Now there's a long downhill section on the pavement and we turn onto dirt roads. I normally prefer to walk most of this section. This year there is lots of mud and puddles are everywhere. I remember going through an underpass where we cross ankle-deep water for 10 meters. Something you don't expect during the Spartathlon for sure. I’m doing ok as long as I’m running but as soon as I'm reduced to walking on the climbs I get bad shivers. It was kind of funny at the beginning but now it's getting serious… 1 mm, huh? Thanks accuweather! Sparta Photography Club. I'm running fast to keep myself warm but at what cost? 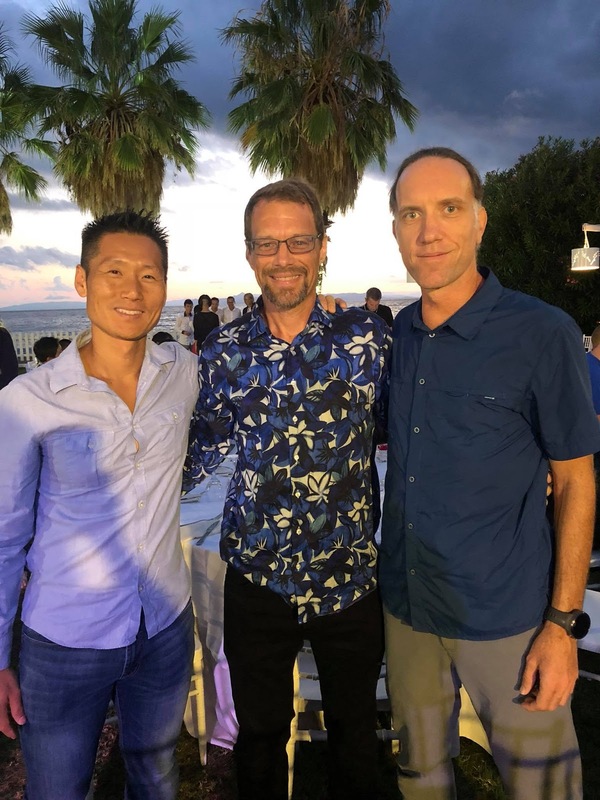 I had remained loyal to my pacing strategy since the beginning of the race and I’m thinking that this will surely come back to bite me further down the race. I try to focus on what I can control. A small bit of halva in my mouth but it's getting so hard to chew. The cold water begins to make me sick and I can only take a few sips of coke. I only know too well where this is going. For almost two hours the rain is relentless, and I arrive in Malandreni at about 140K in 14 hours. It's 9 pm and I'm 110 minutes faster than my best time. Yes, in theory it looks very good, but I already start to feel the effects of fast running during the last two hours. As soon as I enter the CP I get shivers once again. I immediately take my wet clothes off and put on a base layer. It looks like the time to bring out the big guns. I put on my gloves and my Gore-Tex rain jacket. I sit on the chair and stretch my legs. Time doesn't matter for now, I need to rest a little bit for sure. I'm trying to drink some soup. No. Try a sandwich? No. Water? One sip. I sit on the chair and close my eyes, need some time to let my stomach settle. The rain continues with the same intensity but my new rain jacket is bulletproof. The only problem is I still can't eat anything. Before the race I reminded myself over and over again that no matter what happens I'll always remember that I'm lucky to be running the greatest race in the world. I do that. I also take inspiration from the bracelet I have on my right wrist, a present from my brother. The bracelet on my right wrist. After sitting for a long time I start to run decently once again and reach 148K not too long after. The problem is I have to sit another 10 minutes for my stomach to settle. It's frustrating but I don't see any alternative. Suna and Kerem offer me everything but nothing seems appealing so I just have to reject them all. I feel a bit like a spoiled kid who turns down everything his mom prepared for him with great care. They never let on, but it must have been frustrating for them, too. Now I have 11.5 km to go and then I'll arrive at the Mountain Base at the 100 mile mark (99.5 to be exact). 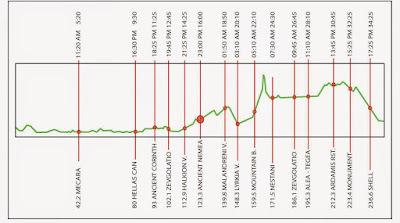 The first 2 km are flat, the next 3.5 km are slightly uphill and the last 5.5 km are where most people power hike. It’s difficult but at least the rain has finally stopped. I put my head down and march on. I still have 2.5 km to climb and I sense that I'm super low in energy, almost sleepwalking. I can see headlamps moving at the top but nobody is close enough to interact. I eat a bit of apple at the final CP before the mountain base. At first it seems to taste good but after two minutes I suddenly have a vomiting reflex and throw up a little bit on the side of the road. A few more tries but unfortunately nothing significant. I reach the Mountain Base CP in 17:08 hours. It's 8 minutes past midnight and I'm 2 hours ahead of my previous best time. Kerem had prepared soup and Suna has a cheese sandwich handy. I drink a few sips from the soup and take a single bite from the sandwich. I hold a bag in my hand in case I throw up. Unaware of the incident a few kilometers earlier Suna jokes, "If you finish without vomiting this year, I'm going to throw a big party!". I smile and tell her what just happened. "That was just the trailer, though. Hold on tight because I may soon release the full-length movie". I enter the two kilometer steep trail in order to reach the peak of the Artemisio mountain at an altitude of 1100 meters. Unlike in previous years the trail is quite muddy. I'm slow but it's probably not too bad. I think it takes me more than 25 minutes to reach the top, and I have to sit there for a minute to have some water. Fortunately, they have warm water of which I can drink half a cup without getting sick. Even though they wrap me in a blanket the wind is very strong and it's definitely chilly at the top. I quickly get up and start to go down the mountain. I'm slow again but that's OK. What's weird this year is that I don't see anybody either climbing or going down the mountain. I wonder where everybody is. 160km/100 miles. Mountain Base. I'm trying to get a sip from the soup with the bag on my hand in case I throw up. The top of the mountain. 162. km. I'm just sitting there for a minute, drinking warm water. After I go down I try to eat some halva but it doesn't work. At the next CP I drink a cup of coke to get some energy. I go 50 meters and throw up once again. A volunteer comes from the station. At first I'm concerned about what she'd say but understand that she just came to give me some wet wipes so that I could wipe my face. I thank her for the help and continue. I need to walk the better part of the next kilometer to feel better. The frustrating thing is that I still couldn't throw up properly. Now I have 8 km to go until Nestani (171.5K) and if you're in a good condition you can run the whole stretch except maybe for the last uphill 500 meters. Unfortunately, I can only run with walking breaks at the moment but I still reach Nestani in 19:05. That's 2 hours 15 minutes better than my previous best. Now I really have no energy to go on. I don't really remember much of what happened here but my brain wants to shut down for a while. I remember looking around with empty eyes. I lose 20 minutes in total. 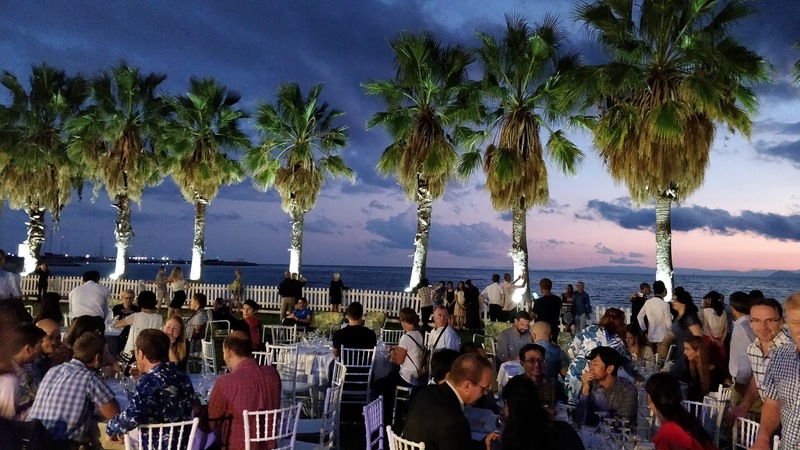 Yes, I arrived much faster this year but what happens at Nestani is almost identical each year. I guess one of my biggest goals in life is to be able to arrive here one year, tell my bib number and continue without stopping! It's now 2:30 am and after stopping for so many minutes I once again force myself to run fast so that I can get warmer. I run at a decent pace for 4 kilometers and it finally happens. At the 53rd CP I force myself to drink some water and 30 meters later I throw up anything and everything until there's nothing left. The volunteers are concerned. Someone comes from the CP to check my status. I thank them, say that I need some time but that I'll be fine. In 2014, I ran a section of the race before the mountain with Wilma Dierx from the Netherlands. I threw up numerous times when I was running with her. My vomiting episodes continued in 2015 and 2016, too. Wilma and I were staying at the same hotel this year. At the breakfast she introduced me to her friends who were going to run the race for the first time. She said, "Let me introduce you my good friend Aykut. He threw up every time he ran this race but every time he managed to finish. So, if you throw up during the race, just remember this guy and don't give up!" Hahaha! After the initial shock I remember this conversation and that makes me smile for a bit. I finally got this out of the way again this year... Now I'll finish for sure! (Wilma successfully finished for the 5th time this year). I reach the 186K mark with a run/walk pattern. This part is really depressing because this year my legs feel quite good but with no energy it's very difficult to run on this flat and very runnable section. What's interesting is that I don't remember many people passing me. I have to sit for another 10 minutes at the next CP and decide to eat only mashed potatoes. It's been almost an hour since I threw up and my stomach now accepts the potatoes. For the next 10K I certainly run much better. I can sense that things are getting better. I start to drink water and coke without much problem. I shouldn't get too excited but it feels good to be back from the dead. I tell Suna that I'll only eat mashed potatoes and drink coke from now on. Kerem adds some milk and the consistency is similar to baby food. Let's see if it really works. The rain starts again and it now becomes really annoying. But with some food in my stomach I can now run at a decent pace and finally reach 195K. There's a fire here for those who are cold. I again sit here for 10 minutes but think that unlike the previous ones this one was not necessary. Little do I know that this would be the last time I sit before reaching Sparta. The elevation graph is now far behind. I'm sure you forgot most of it so I'd better post again! When I leave the 195K CP, I start to feel physically strong again. My energy level is definitely up. This is also a mentally motivating place to be because 200K is an important mental barrier and you're now very close to it. Since I start to see the light at the end of the tunnel, I once again begin to think of my finishing time. If I don't have another bad patch, it's still likely that I could go under 30 hours. When I think about what I had experienced in the last 8 hours it seems nothing short of a small miracle. I thank my crew for bringing me back to life and focus on making the best of it. I glance at my watch right after the station and I understand that I will cross 200K in 24 hours. I need to run the remaining 46 kilometers in six hours. When I consider the climbs I realize that it won't be easy and it'll probably go to the wire. Then something very strange happens. Around 199K, I take another glance at my watch and see the race time as 22:54. What? I look at it again thinking that I should be seeing it wrong. It must be wrong. Either that or I'm seeing hallucinations as my brain is half dead at the moment. Is it possible that I accidentally paused the watch? (not possible, I know I locked it at the start). There's no one around to ask. Think, think. If I had been on the road for 24 hours, it would have to be 7 am in the morning and it should be getting light. But it's still pitch black. Hmmm, what's going on here? When I am finally convinced that I'm passing the 200K point in 23 hours I feel two very intense emotions one after another. The first one is a form of happiness that I can't describe. Think of getting an email from Nigeria that says a distant relative of yours has died and you'll be receiving a huge inheritance. You laugh and proceed to delete it without thinking twice only to realize at the last second that this time it's not a scam. Yeah, that kind of happiness! It is then followed by a strange disappointment. Why? Because if I didn't know this, I'd have probably run the last part in 6 hours and finish under 29. But now I suspect that I'll play it safe and just be content with finishing under 30 hours. The human brain is very prone to this and it's extremely difficult to convince yourself otherwise, especially after running hard for 20+ hours. I think to myself that what will happen is that I'll gradually convince myself that I did my best and conquered my pre-race goal of sub30. I'll then write a report and convince everyone that I gave my all to go sub30. I won't do that to fool people, I'll truly believe it myself. But in reality that won't be true. So, I really wish I hadn't known this. That's the reason for my disappointment. Now, you need to know two crucial issues before we move on to the rest of the story. 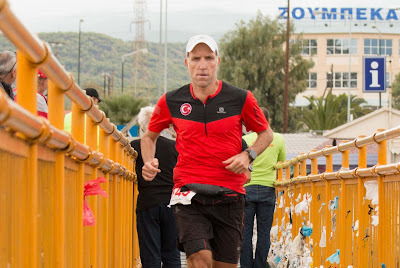 The first one concerns Spartathlon 2015. 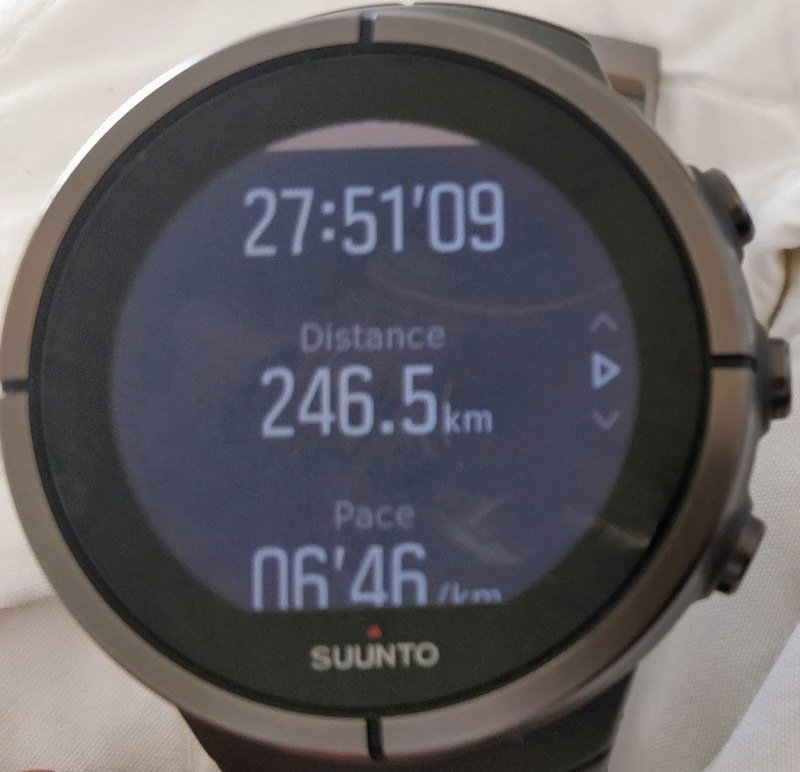 As you can read in the race report, that year I ran the last 51 km (195K to 246K) in 6 hours and 2 minutes. That split was one of the better times that year. 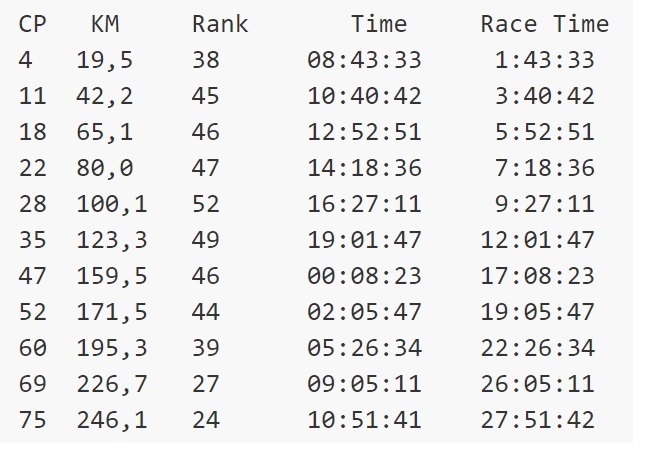 I was 70th at 195K and moved up to 43rd spot at the end with a total time of 31:20. That year we didn't have a medicane but the second day was cooler than regular Spartathlon weather. Therefore, I knew that I could have a strong finish at the end of a long race if the conditions were right and I was feeling good. In addition, compared to 2015, I'm definitely a better runner across the board. Physical and mental endurance, overall experience, problem solving and determination, you name it. Let's put this information aside and move on to the second one which is a little bit more troubling for me. In order to explain this I need to take you to the Barcelona 24-hour track race that I ran in December 2017. As I previously mentioned, I ran 225.897 km and topped all of my pre-race goals, including the Turkish National Record and Spartathlon auto qualification requirement. It was my first 24-hour race and I didn't have any crew. It was one of the most satisfying races that I have ever run and is still one of the races that I'm most proud of. However, a few months after the race there were some changes in my initial feelings. During that race I ran up to my full strength for 21.5 hours but I couldn't convince myself to keep going harder once I guaranteed going over 216K and achieved all of my goals. I walked almost all of the remaining time and started to congratulate myself while he race was still going on. Of course I was very tired but I know I could have still run. The truth is, I didn't want to suffer more and convinced myself that I did my very best. No, that’s not true. If I hadn’t shown that mental weakness I believe I might have run at least 232-233K. Would it have mattered? Maybe not much in terms of numbers, but the important things is that I would have known that I did my absolute best. I’ve started running relatively late in life. I wasn't fast to begin with and didn't have a natural talent for running. I had to work hard and compensate my physical drawbacks with good planning, strategy and mental stamina in order to reach a certain level. I’ve always therefore thought of myself as a mentally strong runner. When I realized that I didn't do my best when I had a very good opportunity it left a bitter taste in my mouth. It also made me realize that I wasn't as mentally strong as I had thought. That was a tough lesson to take. My father used to tell me "Do whatever you want and be whoever you want to be but just do your best". If a good opportunity presents itself, I think it's our obligation to use it as best as we can. Most of the time we think we can do it better in the future, but nothing is guaranteed. I witnessed quite a few instances of this in recent years. I should have done better when a lot of seemingly independent elements came together. But I couldn't show that strength and instead took the easy way that day. Will I ever get that chance again? Maybe yes, maybe no. Who knows? So, when I realize that I really am passing 200K in 23 hours, this is the first thing that comes to my mind after the initial joy and disappointment. I know that when the race is over, I don't want to experience the “Yes, you did good but you know you could have done better!" feeling once again. Maybe if it were a different race it wouldn't be that devastating, but I know that I sure don't want it to happen at the greatest race in the world. After going back and forth a few times in my head I make a promise to myself. No, I don’t want to feel like that again. I will use this opportunity to the best of my ability and accept the result as it is. Of course, making the promise was the easy part. The question was whether I was up to keeping it. The long climb starts roughly at the 199K mark, continues for 5 kilometers and every year it forces me to walk almost all of it. This time it's quite the opposite. I'm able to run most of it with short walking breaks, overtaking quite a few people. I arrive the CP at 206.3K in just a little over 24 hours. In previous years, I used to turn off my headlamp somewhere between 172K to 180K. This year I leave it at 206K. 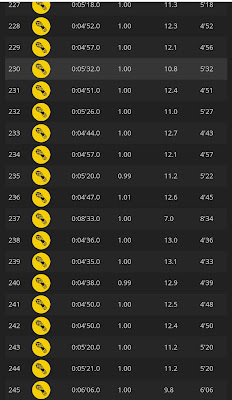 I'm on course to finish sub29 but I don't want to keep making calculations in my head just yet. Instead, I focus on running every kilometer as fast as I can. I'll look at the time during the last 10K. The mashed potatoes and coke diet seems to be working well. I ask Kerem to put it in a cup. I run with the cup and a spoon, and I eat a couple of spoonfuls every now and then. I know it may sound weird but it seems to be working well so who cares? I'm supposed to slow down with the increasing distance. That's the nature of things, right? This is what happens when you have more than 200K on the legs. But it's the opposite this year. I feel good because I'm running faster. And I run faster because I'm feeling good. I know I'm faster than in 2015 because that year I was walking the uphills. This time I'm running most of them. I stop a little too much at the 212K aid station and Teija from Finland, with whom we parted ways around 120K, passes me without stopping. She's the first person to pass me in the last few hours. She was strong on the uphills when I first saw her and she probably ran almost all of the 5K climb. During a long downhill I speed up and catch her. I realize that she holds the 3rd position among women. After chatting with her for a little bit I wish her success and speed up. This will be the last time I see her. She'll finish third in 28:34. I keep running fast in the heavy rain and pass others as if they are standing still. Approaching 220 km I get a crazy thought in my head. If I can run a little bit faster, I might even go under 28 hours! But I immediately try to put that thought aside. Don't focus on the clock. Don't put a limit on yourself. Just try to run every kilometer as fast as you can and we'll look at the time in the last 10K! I'm so much faster than the expected arrival times for the CPs that my crew is genuinely surprised. Although Suna saw me running this section fast in 2015 she's visibly shocked. I get somewhat of a wicked pleasure from that. I like it when I arrive unexpectedly when they were probably planning to take a nap in the car. I take a sip from the soup at 223K but my stomach is not very happy. If it's not broken don't try to fix it. Back to mashed potatoes and Coke. As I'm leaving the station Suna says that I'm 28th in the race. "I'm not interested in my position. I just want to run as fast as I can" I reply to her. This is really how I feel at that moment. There's one last long and steep uphill after this CP. During this climb I remember what Suna just said. 28th out of 400 runners means top 7 percent. I have to admit it sounds quite good and provides me motivation to run when I want to walk this uphill. (Thanks Suna, it worked!). I pass the timing mat at 226K in 26:05. Almost a half marathon to go now. By the way, did I mention the downpour and stormy winds in the last few hours? Well, it doesn't matter, because I'm so focused on the task at hand that I'm almost not aware of what's going on around me. In reality, Zorba the Medicane is now in full force around Sparta. As I'm about to reach the last crew station at 236K it's hard to describe the rain and the wind. 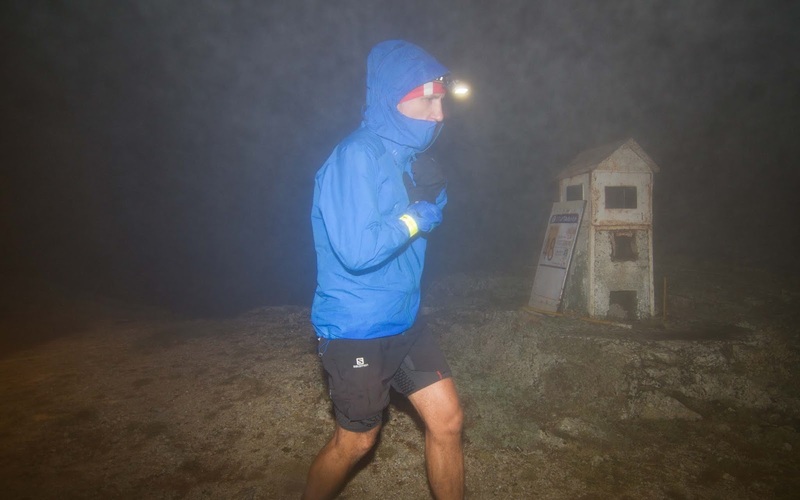 Perhaps the videos below, shot by support teams waiting in Sparta, will give you an idea about the conditions. I arrive at 236K CP in 26:52. Here, I change into my finishing T-shirt and I also need a toilet stop. I lose 3-4 minutes but it doesn't matter. If I can run the remaining 10.5 km in one hour I can finish under 28 hours which sounds crazy. I decide that at this point of the race it's OK to focus on the time and a sub 28 seems like a big enough challenge to do my best. As soon as I leave the station I start to run as fast as I can. I just don't want to arrive there in 27:59 feeling the pressure. I need to enjoy the last kilometer before meeting the King. I'm thinking of some metaphors to describe the rest of the way but it's hard to come up with something. In my 2014 race report I wrote that "This is not a Hollywood movie. You just can't start to run as if you're reborn at a point later in the race. It doesn't work like that in real life". I still more or less believe that but I think I need to make a correction. 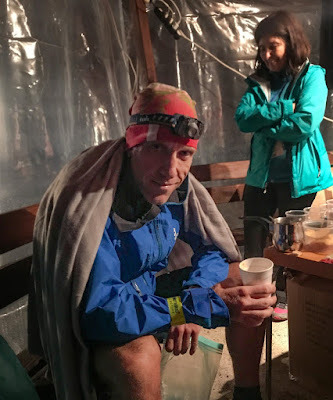 My previous experiences taught me that if you run long enough, if you pace yourself, if the conditions are met, if you're mentally prepared and if you have a strong enough motivation (I know lots of if's) then weird things can happen in the world of ultrarunning. This is definitely one of them. I know it's ridiculous for me to run this fast after 230K but I'm certainly not going to object! Approaching Sparta it's hard to describe my feelings. It's as if I had just started running. The roads are flooded and some road signs are toppled over. I'm literally running in the water but have a big smile on my face. Unless I get hit by a loose brick coming from a rooftop I know I'm going to do this. I enjoy it more as I get faster. I get faster as I enjoy it more. Tell the King that I'm coming early this year! I cross the bridge through ankle deep water just before the last checkpoint. Now I have 2.4 km to go to deliver my message. Just as I do every year, I shake the hands of the volunteers at the last aid station. I always say that you can't have a race without volunteers. Even if you could, it wouldn't have a soul. 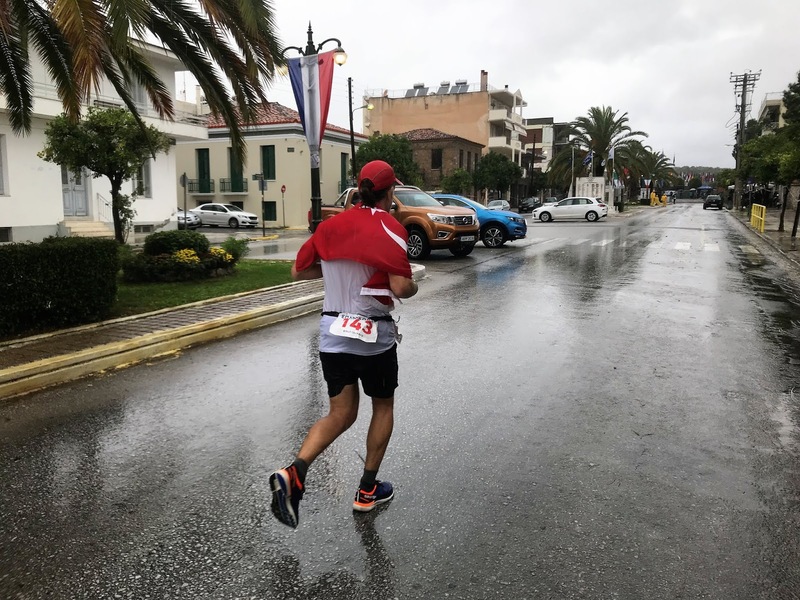 The Spartathlon volunteers once again did an incredible job this year in these very tough conditions. We can't really thank them enough. After a while I see Kerem with the flag. He congratulates me and says that Katerina, second place woman, passed just a few minutes ago. I look at the watch one last time. It's so hard to believe but it really happened. Now I can relax for a little bit. We run the last kilometer together. I don't care whether it's in scorching heat or in a hurricane. This is the greatest finish to the greatest race. A mixture of intense emotions that never get -and will never get- old. 27:51:41 and 24th place. I think I can only say one thing. Yes, this time was above my expectations. But the more important thing is that I know I'll never look back and say "I could have done more". Not in two months, not in twenty years. I know I did my absolute best and that feeling is more precious to me than those numbers. Suna and Kerem, can't thank you guys enough. We did it together. Don't be sad that I couldn't eat much of what you had prepared. I ate all of that and much more in the last week. Thanks to everyone at the International Spartathlon Association who worked hard for the race to continue as planned, to the volunteers and the medical personnel who helped us in the middle of a hurricane. 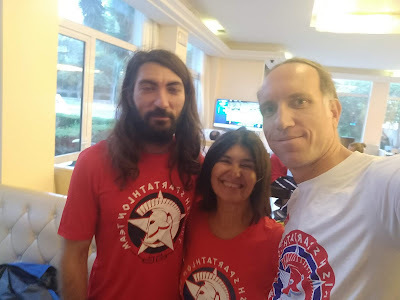 To Spartathletes such as Giorgos Panos and Angela Terzi who volunteered during the race. To the Sparta Photography club and everyone involved in the video productions. 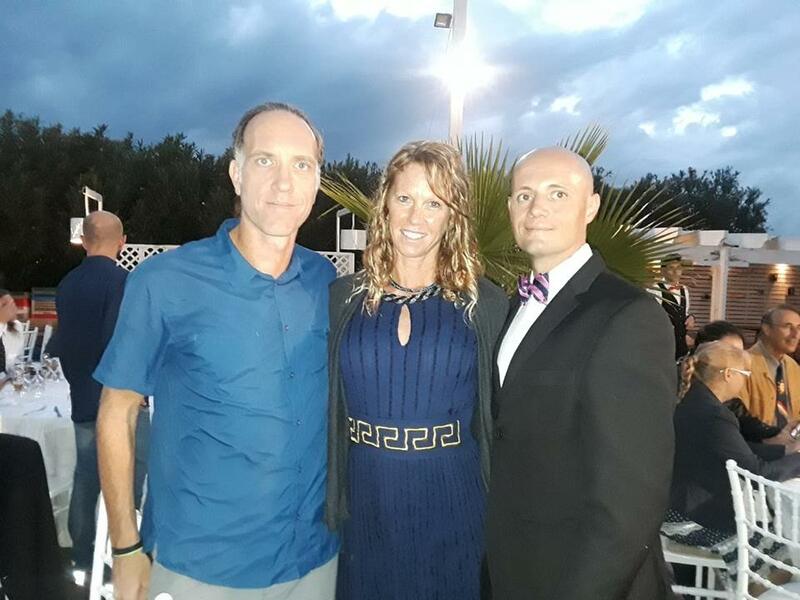 It's hard to think of the Spartathlon without your work. To everybody who started this year's race regardless of the outcome. I was lucky to finish early this year. Most of you had a much harder time dealing with Zorba. I can only imagine what you went through in the final hours. Nothing but respect regardless of the outcome. And to all of my friends who supported me with their messages. Thank you all. After having a good breakfast on Sunday we took our customary photos with the King as a team. Then I ran the Spartan Mile (details below) before attending the Mayor's lunch in Sparta. Suna and Kerem needed to go early this year so they left for the airport after the lunch. I took the organization's bus and returned to my hotel in the evening. Monday was a relaxing day at the beach. The awards dinner was absolutely great with lots of food and dancing. It’s been 10 days now. I’m in very good shape and recovery is going well. My biggest nemesis in Spartathlon was once again my stomach and digestion problems. For some reason, the things that work in other races just don't seem to work here. Nutrition is a very personal issue and everyone needs to find what works for them. I see this as an opportunity to develop myself as a runner. I guess I'll just have to continue by trial and error at races longer than 15 hours. When I look at these numbers a few things catch my attention. 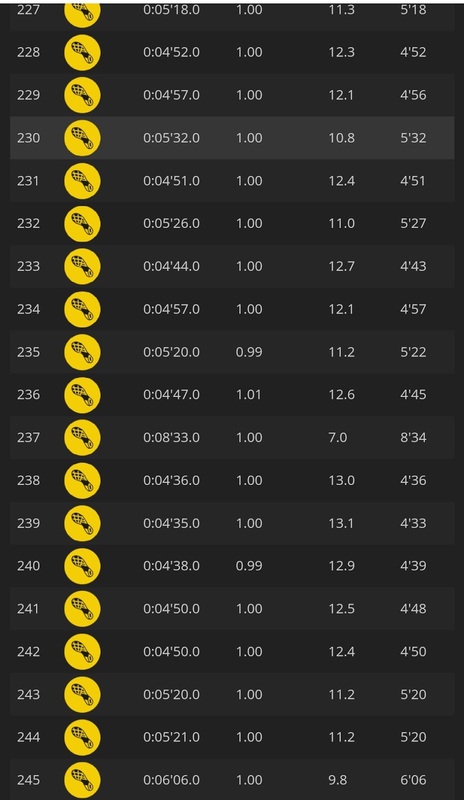 I thought my 100K split of 9:27 was quite good this year but apparently it was my lowest position (52nd) in the race, which is quite interesting. For comparison, my 100K split in this year's 24-Hour European Championship was virtually the same but I was in 39th position. The EU Championship was held on a flat loop while the first 100K of the Spartathlon is a rolling course. I think this shows the quality of the Spartathlon field. The other thing that strikes me is that I didn't lose position despite feeling very bad between 123K and 195K. I think I wasn't the only one having problems during the night. Ishikawa, not surprisingly, had the strongest finish while Bob Hearn and Patrick Hosl followed him closely. 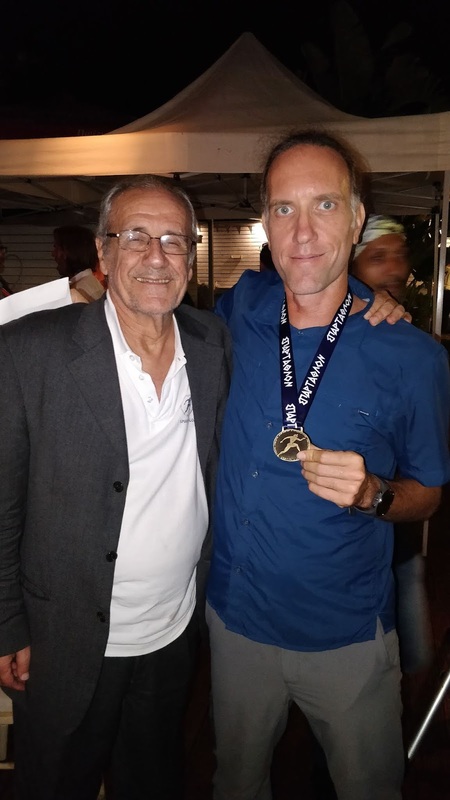 Patrick is a great 24-hour specialist with almost 120 ultras to his name and finished Spartathlon for the 4th time with a personal best. Bob, on the other hand, is the master of pacing and finishing strong. 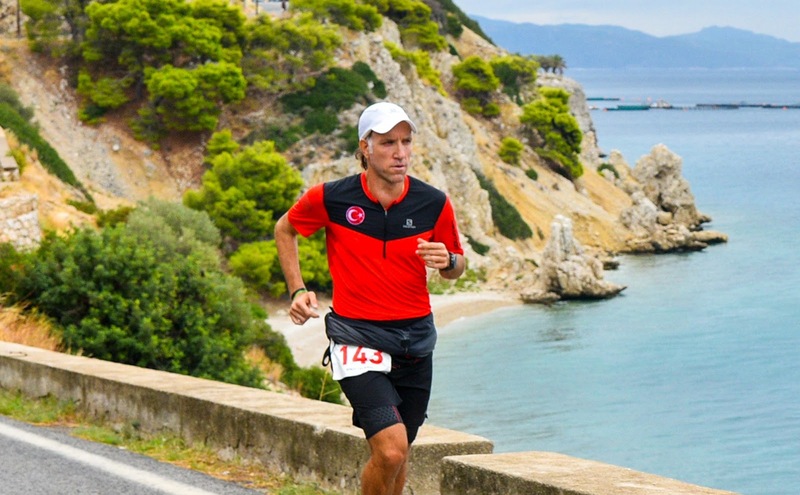 He also has great experience in the Spartathlon with three sub30 finishes. Despite losing 15 minutes due to a missed turn, he still finished with a PB of 27:02. So I guess, being close to his split means I did OK! All's well that ends well. This saying is especially valid for ultramarathons. If you have a good finish the brain quickly forgets all the negative experiences. It’s a good thing because if it didn't do that not many people would run more than one ultra! Since the ending was good for me, it's easy to think that I didn't have many problems this year. But the truth is different. If you had asked my crew at the 100 mile mark they surely wouldn't have guessed this ending. When I look at the race as a whole I have to say that this is the most successful race I've ever run. I'm not saying this because I didn't have any problems or I did everything perfect. I'm saying it because I started the race with a good strategy, kept my head high when I faced the problems and did my absolute best when I was presented with a good opportunity at the end. "I believe that if you set out on an adventure and you're absolutely convinced you are going to be successful, why bother starting?" I know I can always be broken physically and that there are a lot of stronger runners than me. The thing that concerns me more is the mental challenge. That's why my mental weakness at the end of the 24-hour race affected me so negatively. And that's why I'm very happy with my mental endurance in this race. When I used to play basketball I would remember critical plays from some of the games for years. I think the last 50K of Spartathlon 2018 is already ingrained in my head and it will stay like that for a long time. So, this was Spartathlon 2018 through my eyes. 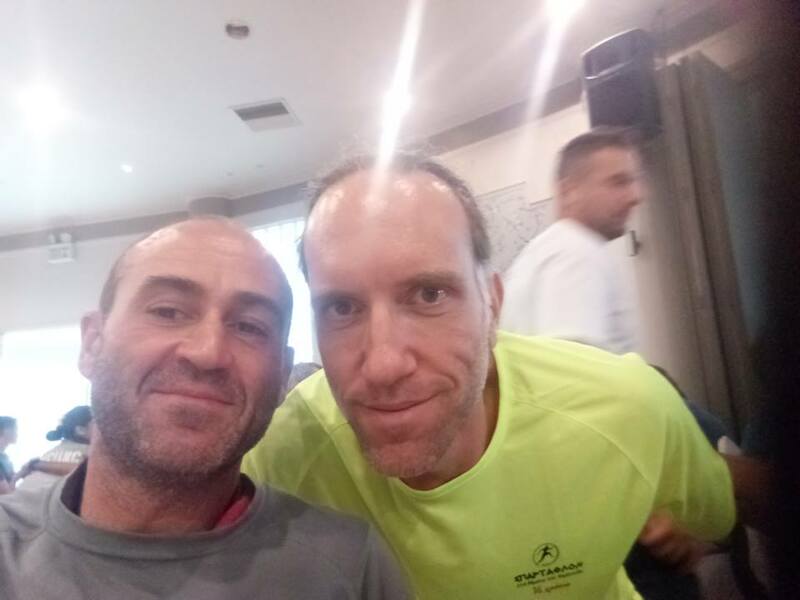 In the 35th Year Album, 3x finisher Martin Cordoba from Argentina says, "I don't run the Spartathlon. I live it". I guess I couldn't have said it any better. OK, don't get too comfortable just yet, the report is not over! Scroll through the photos for the last part). With Suna and Kerem. Well deserved photo with the King. With Andrei Nana, captain of Team USA with 6 consecutive finishes, and his wife Claire with 6 solo crewing duties. My roommate Roman finished a little slower this year in 29:46. But two sub-30s in one room is not bad! 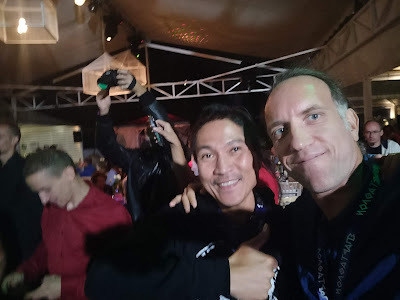 With 3x consecutive finisher Rolando Espina from the Philippines at the finishing party. 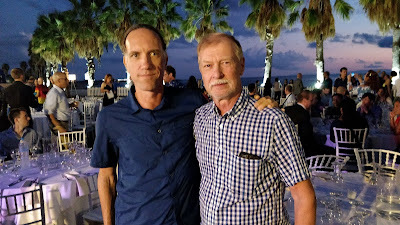 With 15x finisher Seppo Leinonen, a Spartathlon legend. The party venue close to the beach. Arthur from South Africa told me that he had read my previous reports and benefited. He's only the second person from South Africa to finish the race and he did it in 33:40 (national record) despite the tough conditions. With the man himself, Kostis Papadimitriou. OK, since you've read all of this and managed to reach Sparta you now deserve to have a little bit of fun! What is the Spartan Mile you ask. 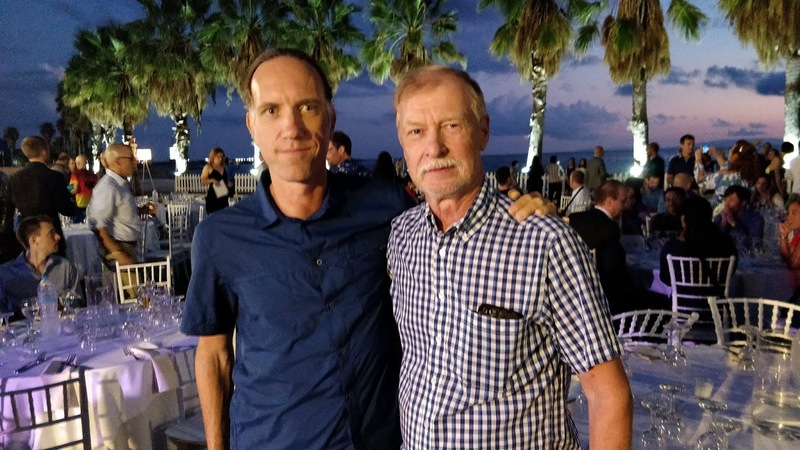 A few years ago after finishing the Spartathlon, two Swedish runners, Johan Steene and Andreas Falk, decided to have a bet to see who could run 400 meters faster the next day. This bet catches on and the next year the whole Swedish team runs it at the track behind the Statue of Leonidas. This year about 30 runners from different countries participated in the Spartan Mile. It's a fun event with some simple rules. Only the runners who run the Spartathlon that year (you don't necessarily have to finish) can participate. According to Spartan tradition everybody needs to run barefoot. The men should be in underpants while there's no dress code for the women. Even though it's technically a "mile", even Spartans wouldn't be crazy enough to do that after running the Spartathlon, so it's only one lap at the 400 meter track. (Reportedly the Belgian team was crazy enough to complete the full mile afterwards). The Swedish team also ran their own heat. 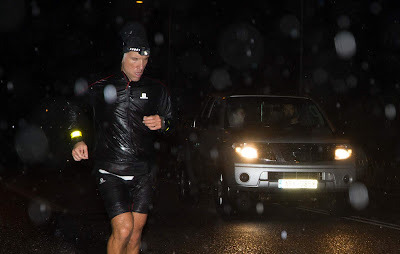 This year's Spartan Mile was run under some light rain and the winner was Juan Andres Camacho Fernandez from Spain with an impressive time of 1:11. I finished almost one minute later at the back of the pack, though I wasn't the last one. What can I say, the rule of specificity is very important in ultramarathon training and I guess I have one year to train for that!